With 2 powerful software in one pack, Aneesoft Kindle Fire Converter Suite for Windows is the best solutions to Kindle Fire conversions on Windows. 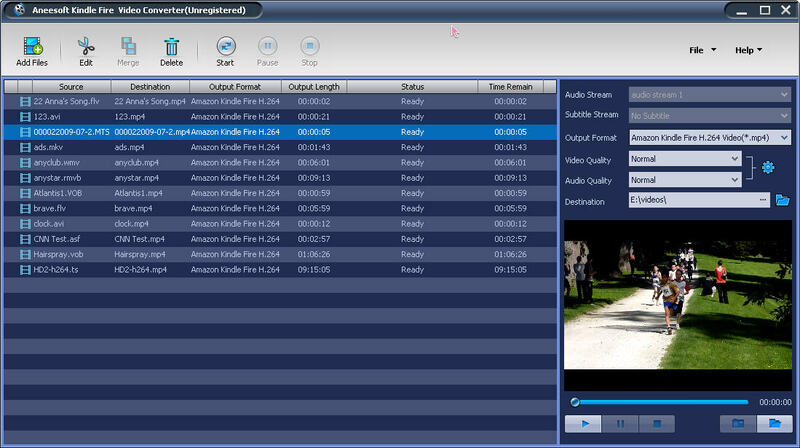 The pack contains Aneesoft Kindle Fire Video Converter and Aneesoft DVD to Kindle Fire Converter that convert any video and DVD files to Kindle Fire MP4 videos on Windows with excellent quality!Aneesoft Kindle Fire Video Converter can convert almost all video files like HD videos. Convert all popular video files and DVDs to Kindle Fire formats. 1. 2.4GHz Intel/AMD processor or above. 2. 512MB RAM (1G or above recommended). ...... to Kindle Fire MP4 files formats. While Aneesoft DVD to Kindle Fire Converter can rip DVD to Kindle Fire formats such as H.264/MPEG-4 video (720P, 1080P, 640*480 etc.). 7. User-friendly interface, easy operation. Qweas is providing links to Aneesoft Kindle Fire Converter Suite 3.2.0.0 as a courtesy, and makes no representations regarding Aneesoft Kindle Fire Converter Suite or any other applications or any information related thereto. Any questions, complaints or claims regarding this application Aneesoft Kindle Fire Converter Suite 3.2.0.0 must be directed to the appropriate software vendor. You may click the publisher link of Aneesoft Kindle Fire Converter Suite on the top of this page to get more details about the vendor.